There’s been a lot said and written about Sydney’s inner-city music scene of the eighties and early nineties – and rightly so. For many it represented the city’s most fertile period of musical activity and produced an amazing array of talent who, if they didn’t achieve mainstream success or particularly lengthy careers, left a legacy large enough to be considered news-worthy so long after the event. Feel Presents has long been a supporter of this era having released two volumes of the 2CD collection Tales From the Australian Underground: 1976 – 1990 as well as promoting tours for Radio Birdman, The (original) Saints, Died Pretty, Laughing Clowns and more. This time around Feel are showing their support for the era via a series of live shows entitled On the Street (a term familiar to all discerning gig goers of the time) and this September, together with the Sydney Fringe, will present a month of gig-going activity recalling that recalls those heady times. But it’s not all about fond memories with support coming from a selection of bands carrying on the traditions of these pioneers, eager to keep the flame of the originals alive. Got you highlighter out? Here’s the gig guide. 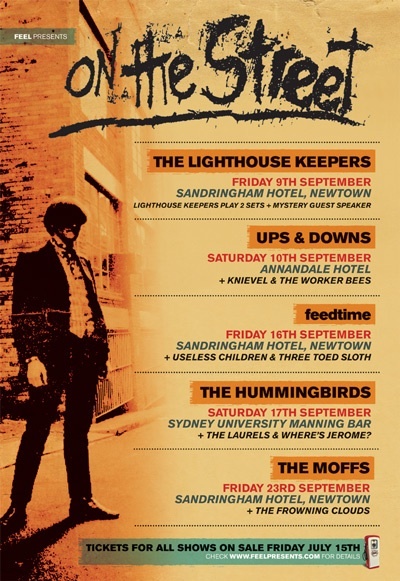 Saturday 10th September: Annandale Hotel .Ups & Downs + Knievel + The Worker Bees. Although largely unheralded in their home country, Sydney’s feedtime recently played a reunion show in San Francisco some 22 years after they first broke up! The show was put together by US record label S.S, a vinyl only label who will be releasing a 12″ of feedtime rarities later this year. It’s not the only forthcoming US release for the band though, with indie-giant Sub Pop also releasing a comprehensive 2CD collection The Aberrant Years that will bring together virtually all the band’s recordings for that iconic independent Australian label. Energised from the San Francisco show, feedtime have also agreed to perform a show for the Sydney Fringe and Feel Presents couldn’t be more proud. Saturday 17th September: Sydney University Manning Bar. The Hummingbirds + The Laurels.